La minera canadiense Yamana Gold –que opera la mina Gualcamayo en la provincia de San Juan- anunció los resultados correspondientes al Estudio de Factibilidad actualizado del proyecto Cerro Moro, localizado en la provincia de Santa Cruz. Este proyecto fue adquirido en agosto de 2012 con la compra de la mina junior Extorre Gold Mines. Gold will resume a decline as U.S. economic growth accelerates, according to Goldman Sachs Group Inc., which reiterated a forecast for the metal to end the year at $1,050 an ounce. Bullion’s rally this year was spurred by poor U.S. data probably linked to the weather and rising tension in Ukraine, analysts led byJeffrey Currie wrote in a report, describing the reasons as transient. With the tapering of the Federal Reserve’s bond-buying program, U.S. economic releases will return as the driving force behind lower prices, he wrote. Gold’s 12-year bull run ended in 2013 as the Fed prepared to reduce monthly bond-buying that fueled gains in asset prices while failing to stoke inflation. Prices rose 10 percent this year even as the Fed cut purchases, with Russia’s annexation of Crimea and mixed U.S. economic data boosting haven demand. Last year, Currie described gold as a “slam-dunk sell” for 2014. Gold for immediate delivery traded 0.3 percent higher at $1,322.01 an ounce at 7:43 p.m. in Singapore, according to Bloomberg generic pricing, after the United Nations Security Council met to address the Ukraine crisis. Bullion last traded below $1,050 an ounce in February 2010. Bullion is the least preferred commodity among metals as prices resume a decline this year on the outlook for rising U.S. interest rates and low inflation expectations, Morgan Stanley said in a report on April 8. Average prices are expected to drop for the next four quarters, it said. Stronger U.S. growth this year and next will help the world economy withstand weaker recoveries in emerging markets, according to the International Monetary Fund. The world’s largest economy will expand 2.8 percent this year and 3 percent in 2015, unchanged from forecasts in January, the IMF said in its World Economic Outlook report last week. China’s demand for gold shows no sign of letting up. 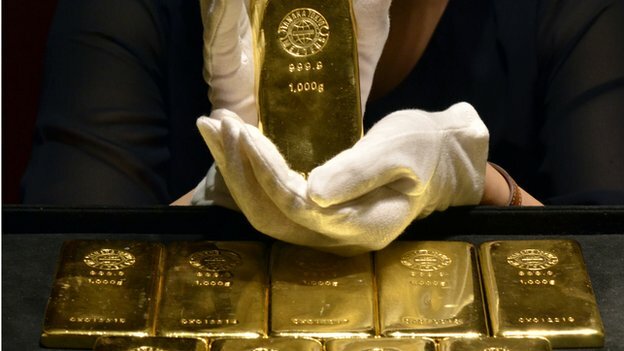 China’s demand for gold is set to rise by about 20% over the next few years, the World Gold Council has estimated, as the population becomes more wealthy. The council estimates private sector demand for gold in China will rise to at least 1,350 tonnes by 2017. Chinese customers bought 1,132 tonnes of gold last year, in jewellery as well as gold bars and coins for investment. The forecast comes as China becomes the world’s largest gold-consuming nation since last year, overtaking India. The World Gold Council says China is at the “centre of the global gold eco-system”, as rapid urbanisation creates a rising middle class. Albert Cheng, from the World Gold Council, said: “The cultural affinity for gold runs deep in China and when this is combined with an increasingly affluent population and a supportive government, there is significant room for the market to grow even further. According to the council, consumers bought a record amount of gold last year, with Asia’s economic heavyweights China and India in the top two spots. In Western markets demand for the precious metal remained strong, particularly in the US, where people bought a lot of gold jewellery as well as gold bars and coins. By Wallace Witkowski and Barbara Kollmeyer, MarketWatch. SAN FRANCISCO (MarketWatch) — Gold ceded gains from last week on Monday, dipping below the key $1,300-an-ounce level, as speculators moved out of long positions. Gold for June delivery GCM4 +0.76% settled down $5.20, or 0.4%, at $1,298 an ounce on the New York Mercantile Exchange. May silver SIK4 +0.69% shed 4 cents, or 0.2%, to settle at $19.91 an ounce. On Friday, gold took advantage of weakness in equity markets to finish the week above the $1,300 mark as U.S. jobs growth in March came in a bit below expectations. The weekly win follows two straight weeks of losses amid a bull charge in stocks. “In this case, speculators had shorted gold over recent weeks (which is why the price overshot to the downside in the post-Crimea correction),” said Brien Lundin, editor of Gold Newsletter, in emailed comments. Outflows from exchange-traded funds, however, are placing pressure on gold, according to Commerzbank, which said ETFs saw outflows of 15.3 tons in the past week alone. “Speculative financial investors have also continued to withdraw from gold: in the week to 1 April, they cut their net long positions for the second consecutive week to 91,500 contracts now – their lowest level in six weeks,” Commerzbank said. “Falling to the lowest levels since mid-February midweek, at $1,280/oz, gold was left exposed by the diminished safe-haven bid that drove it to its highest level since September 2013,” said Barclays analyst Gayle Berry, who added that the analysts expect the “downside cushion” on gold to soften, and the metal to average $1,250 an ounce in the second quarter. Saxo Bank’s Ole Hansen said this quarter is usually a quiet one for gold, though things could be a bit different this time around, according to Kitco News . Elsewhere in metals trading, July platinum PLN4 +1.00% gave up $23.10, or 1.6%, to settle at $1,427.80 an ounce, while June palladium PAM4 +1.02% also lost $23.10, or 2.9%, to settle at $767.65 an ounce. High-grade copper for May deliver HGK4 +0.46% rose nearly 2 cents, or 0.6%, to settle at $3.04 a pound.